There hasn’t been much crafting going on this week, due to the wonderful, unusually warm weather. We have pretty cold winters, so it has been definitely something to celebrate—and I have, every afternoon at the park! It’s been lovely!I was able to work on this fun, easy project, and I’m so happy with it! We moved into our house almost 2 years ago, and my poor girls’ room has been totally neglected. Part of me was waiting for us to get their beds done (we are making FARMHOUSE BEDS for their birthday next month…can’t wait! 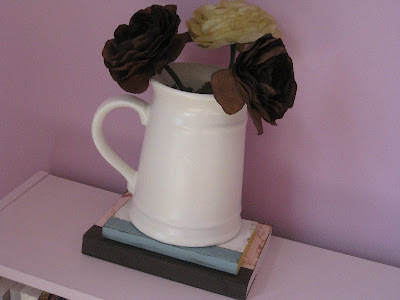 )to really decorate. Now that we are starting to move forward, it’s been fun to figure out what I wanted to do, and think about some of the small touches. I had something like this in mind, when I ran across another blog (I’m so sorry, I can’t remember where!) that had something similar, and it just cemented the idea! 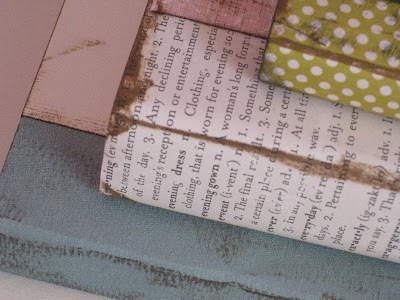 These fun covered books are just that…they look adorable on an end table or nightstand, on the top of a bookshelf, or any other flat surface you like. 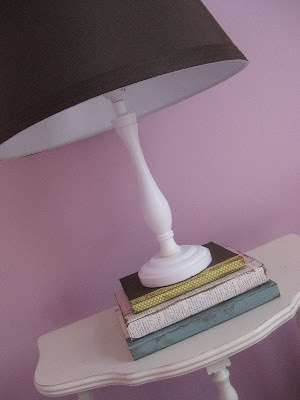 I love when they are stacked under a lamp, or old-fashioned pitcher (I spray painted this one cream), so that’s exactly what I did. 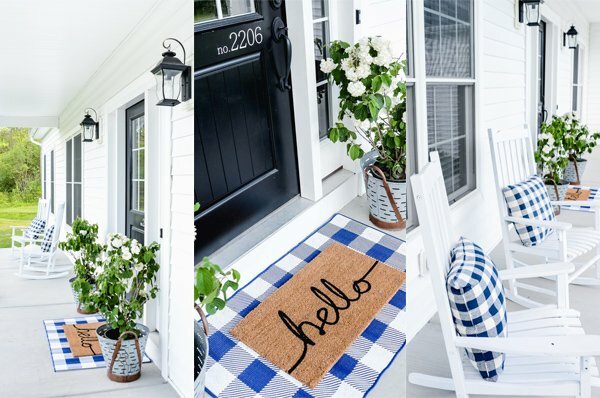 These can be made for any room in the house–family room, master bedroom, guest room, etc. LOVE them! You are going to have three different pieces of paper to cover the book. 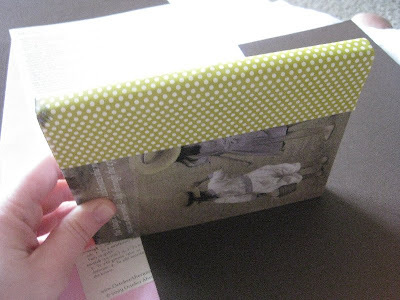 Cut one piece of paper that will fit directly over the spine, and overlap onto each side of the book an inch or two. This will be what shows from the front, so choose paper accordingly. It needs to come right to the top and bottom edges of the book. 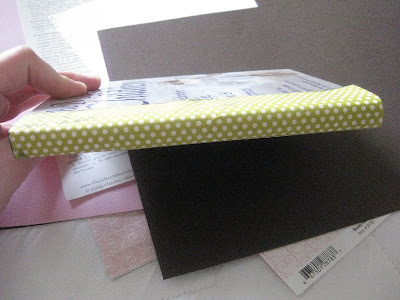 Place double stick tape down the spine of the book, and place your paper over the spine, and crease it well over the edges of the book. Tape down the rest of the paper, securing firmly. Cut two identical pieces of paper for the front and back, also making sure that they fit the book perfectly–right to all the edges. 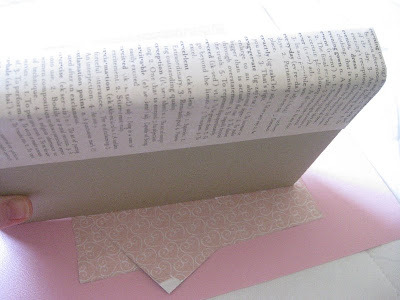 I did this by placing the paper on the book where I wanted it to go, then making creases where it needed to be cut. 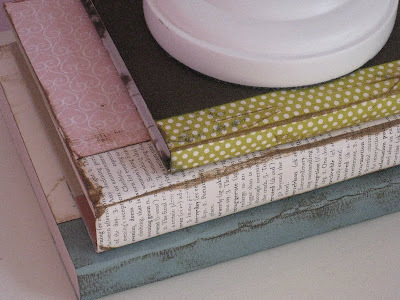 Distress the edges first, then tape them on the book, making sure to overlap the piece on the spine. 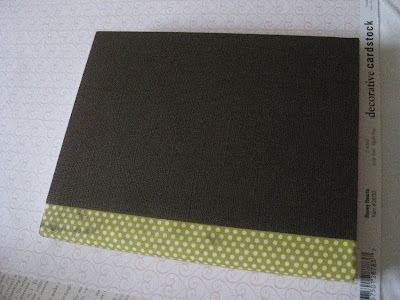 Repeat for each book, mixing and matching coordinating papers as desired. i think these are absolutely adorable. I love them. Totally and completely in love! Gorgeous and not too complicated! Love it! Hi! I came over from New Friend Friday and decided to follow! I love it! So beautiful and easy! Those look so cute! How exactly do you distress them? Do you use paint or something? I'd love to learn how you make it look worn! 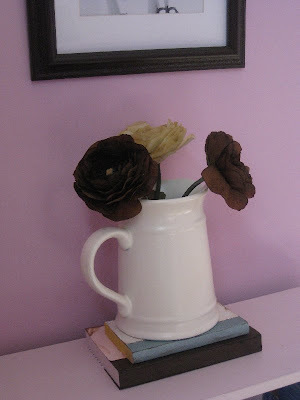 I also wanted to add that I gave you a lovely blogger award on my blog today :-) Thanks for being inspiring! I love the way that looks!! I actually have our books arranged by color and there are some colors that could use a few more books. Maybe THAT is the answer! And I am glad the scrolling button worked for you. What a cute idea. I was looking at decorative books today, and they were $30+. I think I am going to snag your idea, I will link to you when I do! I use distress ink (that's also the name of it). You can buy it at Michael's, or any scrapbooking store. They come in lots of colors (I use the dark brown and black the most), and are around $5 each. It's one of my favorite things!! Dropping by via The Girl Creative and I'm thinking I should have stopped by a long time ago. 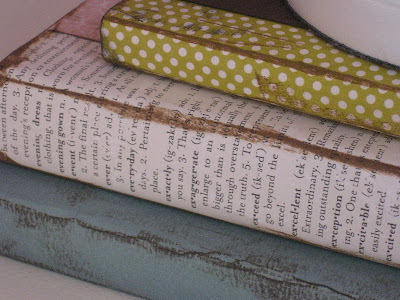 I have been using books for years as decorating items. Probably because I already had them on hand and/or I didn't have any money to go buy accessories. I would take the book jackets off but even then the binding colors weren't always the best. Love you idea of wrapping them like this. This is such a great idea, I love getting old hard back books from thrift stores anyways, but this will take them from ehhh ok to AWESOME! Thanks for the great tip! Very cute! I love the paper selection! 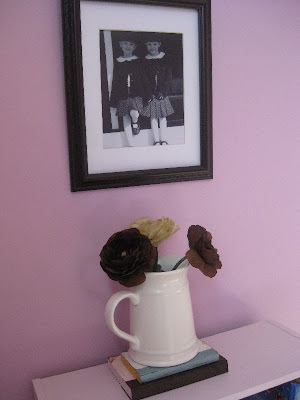 So cute, im going to make some for my girls room!! Giveaway over at my blog. I love old books…. clever craft! Love the papers you chose. SO fun. Thanks for sharing this! 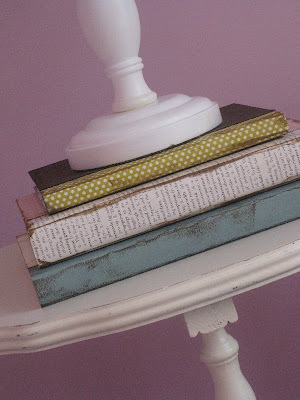 I have tried to cover books with paper and failed miserably, I guess because I tried to do it with one piece of paper. I'll give your version a try!